At only 18 months of age, there was no way Hallie could reach anything but the bottom branches of the massive 12-foot tree standing in the Great Hall of Cairnwood Estate in Bryn Athyn. It didn&apos;t matter. She took a sugared-apple decoration, found a perfect location and hung it. Next to her was Brooke who, at three years old, could reach higher on the tree. 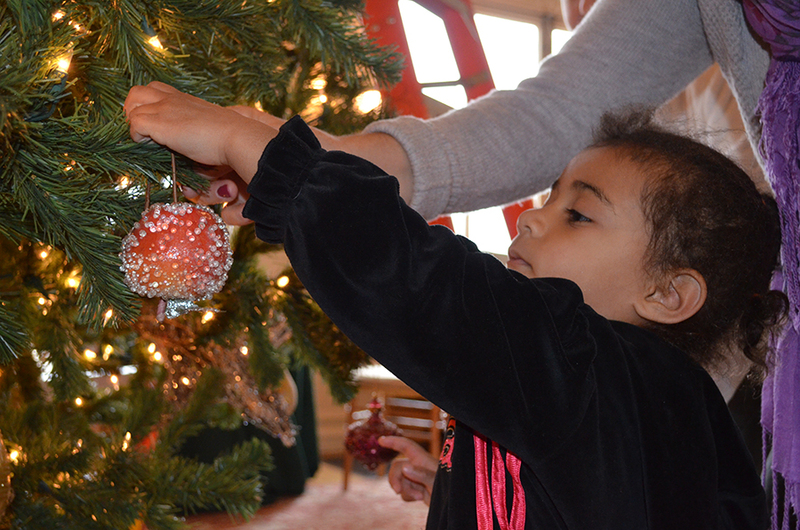 Brooke and Hallie, accompanied by their respective mothers, were two of 40 or so volunteers who braved a dreary, rainy Tuesday in early December to lend their artistic vision to Cairnwood&apos;s Christmas tree. But not much. Cairnwood&apos;s director Shannon Walko watched the two tots and their parent and commented, "Because we make this a morning event on a weekday, we get our share of senior citizens to come out and work. But we also get a good number of parents with preschoolers." She further related that the creative spark exhibited by the decorators is given free reign. 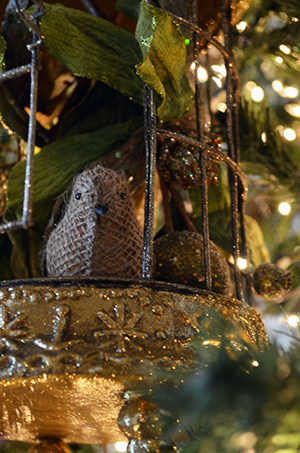 "We use large-scale decorations because smaller items would get lost on such a big tree. But beyond that, we let people put things where they want. So the final product looks just a little different each and every year. "Of course," she continued, "just like in their own homes, people have favorites that they like to see in the same spot year-to-year. But in general, no two of our Christmas trees are ever exactly the same." The process of transforming Cairnwood for the holidays began with the positioning of the tree in Cairnwood&apos;s Great Hall. Each year, it stands in the same location at the bottom of the impressive stairway. According to Walko, the tree&apos;s spot conforms to where the Pitcairn family, builders and residents of the impressive mansion, placed their own tree. "The tree back then would have been real," she said. "But given the length of our holiday season and all the events planned, we can&apos;t do that." One of the first tasks involves attaching the lights. Walko describes the labor-intensive process: "The tree is not pre-lit. Pre-lit trees tend to have lights only at the ends of the branches. We prefer that the lights cover the branches all the way back to the trunk. So we attach them by hand and string them along the full length. That way, the tree is fully lit, and the decorations stand out more." Approximately 8,000 white lights cover the Cairnwood tree. The work of attaching them is done behind the scenes, days before the holiday helpers arrive. That way, the volunteers can dig right into the hanging of the bling. Unable to resist the urge to participate, I picked up a gargantuan geegaw and climbed the ladder next to the tree. Finding a lonely branch, I attached the hook and admired my handiwork. The volunteer crew made the morning&apos;s work as much a social opportunity as a chance to flex their decorative muscles. The session included a catered brunch, complete with champagne, so the effort was offset by a little nosh and a little sip. Lively chatter echoed throughout the hall, and a rotation of classical Christmas music filled the background. Guests were also given the materials, decorations and instructions to make a greenery swag. In the living room, several attendees were binding branches and adding glittery accents. Across the way, in the library, a station was set up for hand-making gift tags. "We like to give people the chance to make something and take it home, as a way of remembering their time here," Walko commented. She continued: "This is our tenth year of inviting the public to decorate. It has become a tradition where we see the same people returning year after year." 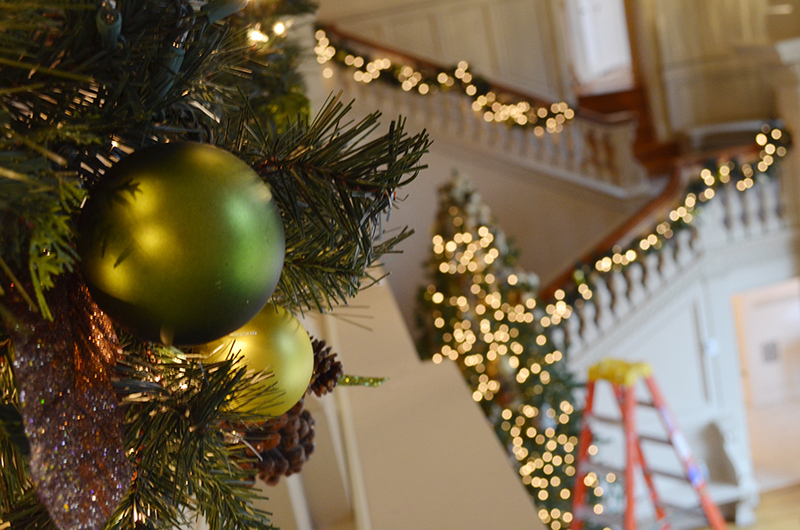 The decorating party was purposely scheduled so that all the frill is in place before the annual "Cairnwood by Candlelight" event, December 10 at 7:30 p.m. During that special evening, visitors can tour all three floors of the mansion, the servant&apos;s quarters and the tower. "Cairnwood by Candlelight" also features a display of Victorian gowns. They are accessible to the public only once a year. The VFTCB isn&apos;t the only organization that thinks Cairnwood is special at this time of year. Currently, the home is vying for the top spot in USA Today&apos;s 10Best Readers&apos; Choice poll. 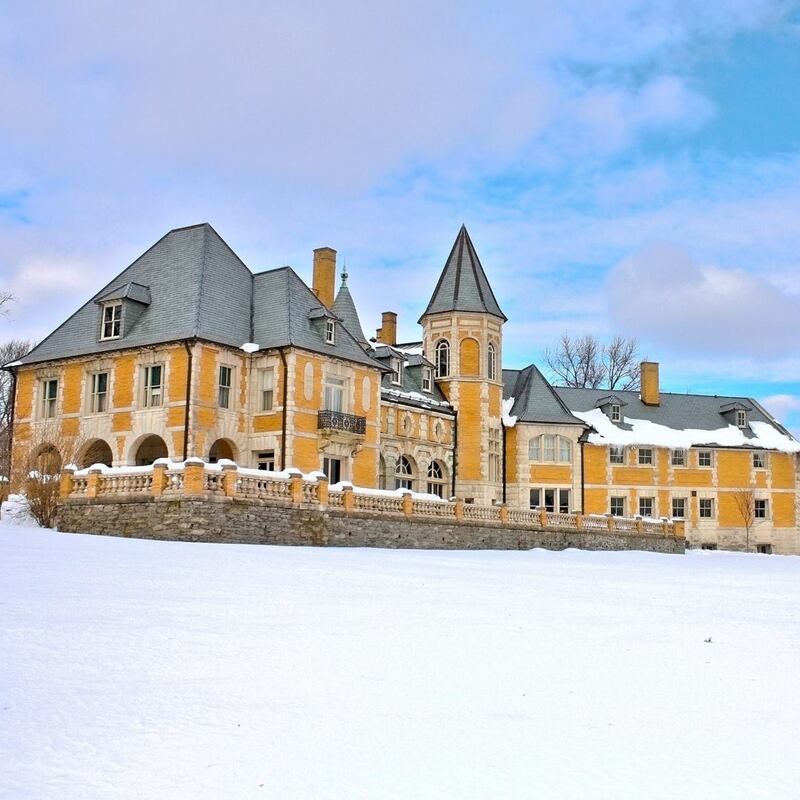 It is now at #2, behind Stan Hywet Hall & Gardens, Akron. Fans of Cairnwood can vote it into the top slot by casting a ballot here. 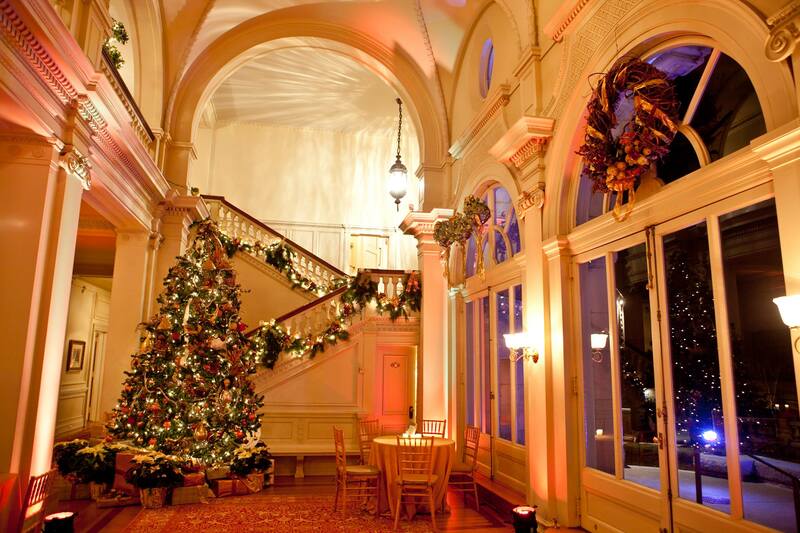 Tickets to December 10&apos;s Cairnwood by Candlelight are $25 and are limited. They can be obtained by calling 215.947.2004 or visiting www.cairnwood.org.